Hello friends! Did you have a good weekend? I hope so! I have enjoyed looking for signs of spring and documenting them in my Signs of Spring notebook that I made earlier this year. Every morning new flowers have sprung out of the soil. 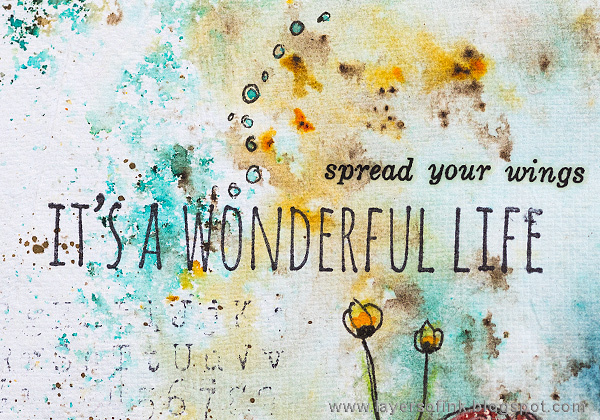 This week at the Simon Says Stamp Monday Challenge Blog we have a Let's Doodle theme. 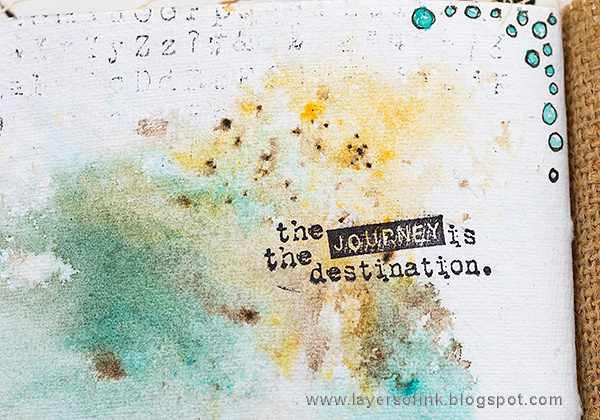 Don't miss the lovely project by our April guest designer Paula Roomer aka PaNaRoo. 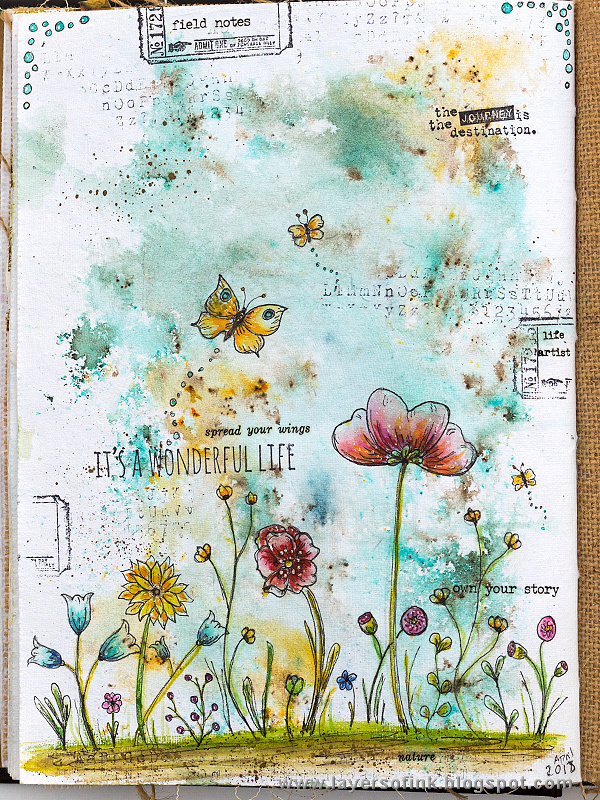 I had fun doodling a field of wildflowers in my Dina Wakley Media Journal. Most of the flowers don't look like real flowers, but that wasn't my aim here. There are also three little butterflies flying around among the flowers. 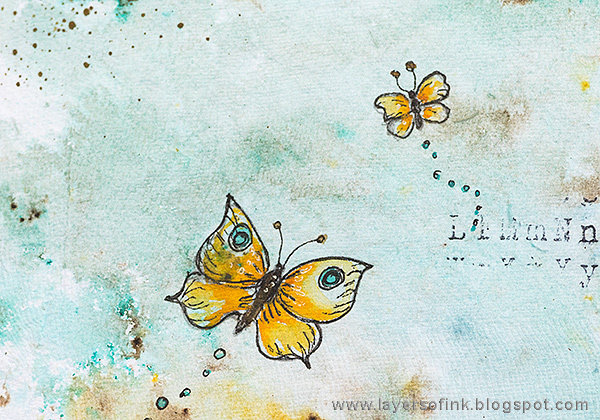 The background was done with Paper Artsy Infusions, using A Bit Jaded and Golden Sands. A while ago, I did a bunch of these backgrounds in my journal, so it was ready to be used. I worked on one of the cotton-rag watercolor pages. I started out by doodling the flowers on the background, without much planning. 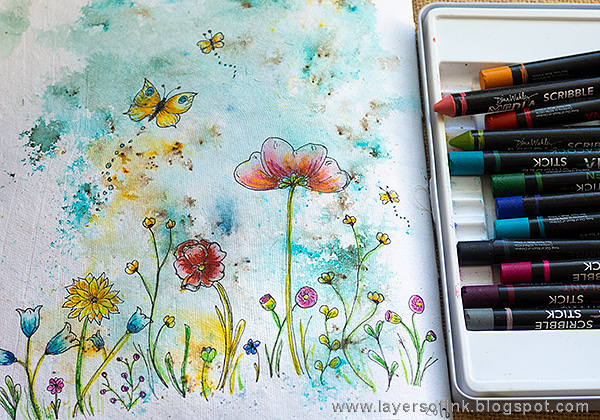 When that was done, I colored the flowers with Dina Wakley's Scribble Sticks, by first applying the stick to the paper and then adding water with a paint brush. For even stronger colors, I picked the color up with a paint brush directly from the Scribble Sticks. 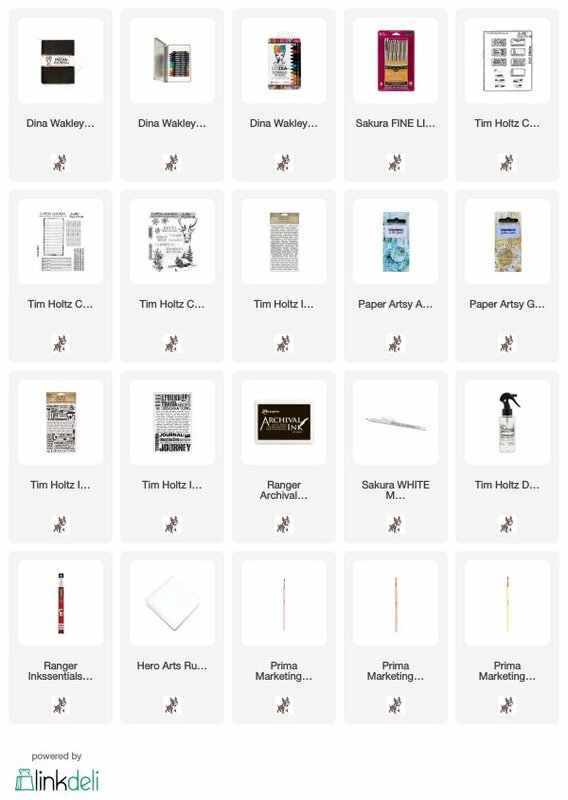 I used both Scribble Sticks 1 and Scribble Sticks 2. When the flowers were dry, I added more details with a black pen and also a few dots done with a white gel pen, for highlights. The butterflies have doodled trails. 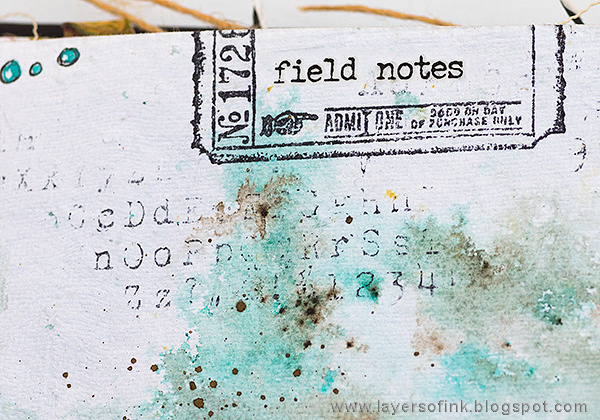 I wanted the page to have a positive message and used this stamp by Tim Holtz as my title. The smaller words and phrases are rub-ons. 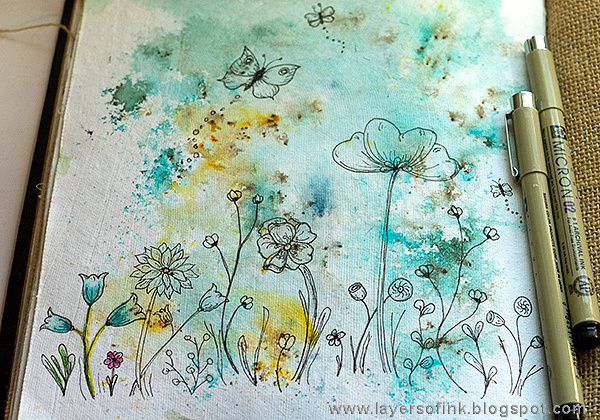 The flowers were grounded to the page with more Scribble Stick painting and some pen scribbles too. The splatters were done with a brown Scribble Stick dipped in water. Flick a paint brush against the top to create splatters. Here are more flowers and sentiments. I also used my favorite alphabet background stamp on the page, from Tim's School Desk set, as well as a ticket from Odds & Ends. 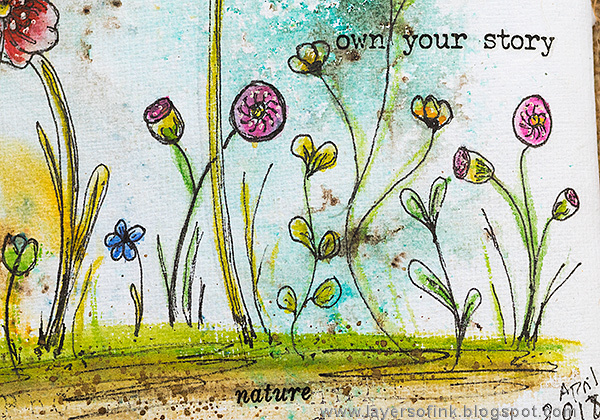 I doodled little circles in the corners and added another sentiment stamp, also from Odds & Ends. I hope you will join us this week in our Let's Doodle challenge. As always, you have a chance to win a $50 gift voucher to do some fun shopping at Simon Says Stamp. You have until next Monday 8am Ohio time. 1pm UK time, 2 pm CET to join in. As usual,I watch with oleasure. I admire the delicate florals and butterflies--they look like professional stamps that you can buy. Your page evokes serenity. Look at your doodling skills! It seems like your versatility as an artist knows no limits! You should be designing your own stamps to sell! Loved the whimsical delicate look of your flowers and how you made them look like they were swaying in the breeze. I really get a sunny feeling watching your project. Love your drawing skills, very nice! 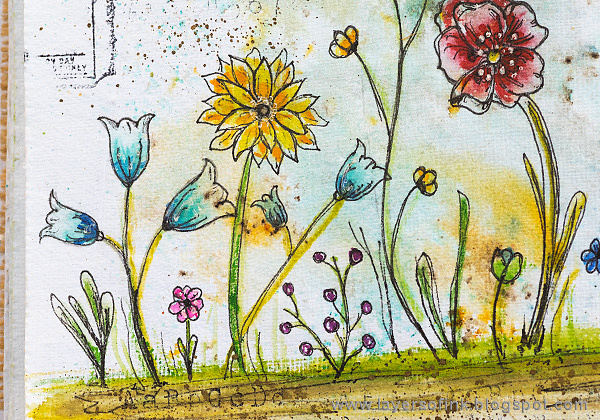 this is such a delightful scene and i love your doodled wildflowers-so charming! Beautuful flower drawings!!! I love your watercolouring and the infusions look great too!!! So soft and pretty! I love your gorgeous blooms! Fantastic page! 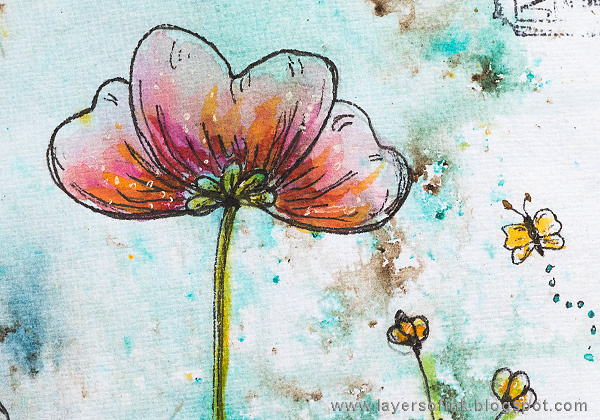 Your doodled flowers are so beautiful and I love the spring scene you've created!